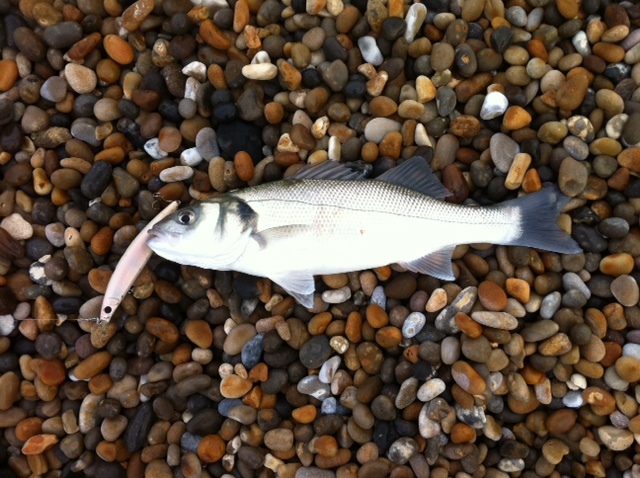 Unusually high numbers of Bass for this time of year are being caught all along Chesil. Normally I would not expect to see many Bass before May, but this year they seem to have stayed around. It is a shame that the water is still coloured, as I would love to have a go on lures. Fishing conditions look good for the weekend and It looks like we might be having a spring run of Cod as well. My mate Paul has been out fishing most of this week. He has ben searching for some Plaice with no luck. However he reports that he witnessed quite a few Cod being landed at West Bexington and Abbotsbury. We might get lucky and see some more landed this weekend. For those lure fishermen out there that are looking for a bargain you might want to have a look at Chesil Bait n Tackle’s website. They are clearing a number of Tenyru Injections at a knockdown price. Great for those that like to be seen with a red rod. Chesil Beach: Calm with a 2m swell that has a long surf run off. The water is coloured. Portland: Swell in excess of 2m with coloured water. Weymouth Bay: Calm with lightly coloured water. Chesil Beach forecast: Much more settled conditions could well lead to better fishing than we have had for the past weeks. The Bass fishing is good and there is the chance of a spring Cod. No Plaice showing yet, but they are starting to show at Brighton. My advice for this weekend is go with large baits, in the hope of a large fish. You are likely to get Pout and Dogfish, but as the water clears, these will only show at night. Portland: Several nice Congers up to 25lb have been landed from the East side of Portland. Take care around the rocks as the swell can be lethal. The chance of Pollock being caught on lures will increase as the weekend goes on and the water clears. Portland Harbour: May be worth a try for some Flounder, but apart from that, it is very quite in the harbour. Weymouth Bay: It has gone pretty quite at Preston now, but the Pleasure Pier, is producing plenty of smaller species.